When you work with monetary values, there are two different formats you can use: Currency and Accounting. You can find them in HOME >> Number >> Number Format. 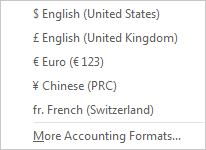 You can also find the accounting format under the Accounting Number Format. When you expand this button, you will see a list of the most popular currencies. If you need more control over the formatting. For example, you want to set the number of decimal places, you can right-click the cell that contains the value, then select Format Cells…. 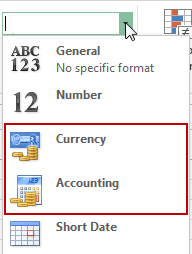 On the left side, in the category box, you will find two items: Currency and Accounting. Accounting format is based on the currency format. Both allow you to select a currency and set the number of decimal points. In the accounting format, the currency sign is located just off the left edge of the cell and in the currency format at the beginning of the value. In the accounting format, there is an extra space between the value and the right edge of the cell. Accounting format displays “-“ when the value is 0.